General view, Dean Park, Renfrew, Lanarkshire, Scotland, 1937. 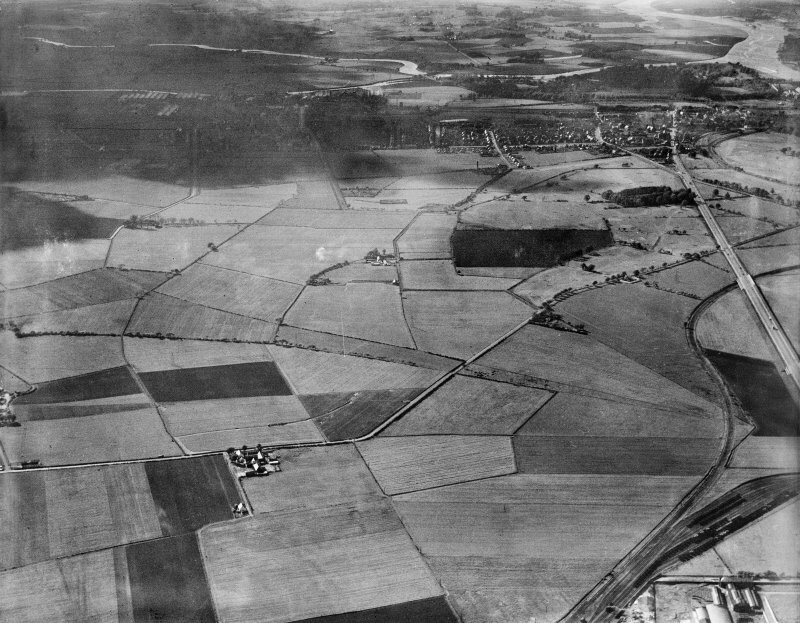 Oblique aerial photograph, taken facing north-west. There was a chapel, dedicated to the Virgin Mary, at the Mill of Renfrew, on the SE of the town (Mill Burn: name NS 511670). This chapel,mentioned in 1414 which stood on the W side of the mill, belonged to the monks of Paisley, and was latterly held under them by the burgh (OPS 1851) (See also NS56NW 22). J A Dunn 1971; Orig Paroch Scot 1851. The priory of St. Mary and St. James of the 'inche' beside Renfrew Castle is mentioned in a charter of Malcolm IV, 1163 x 1165. This priory, in which had been placed a prior and convent from Wenlock in Shropshire, was probably founded by Alan,steward of Scotland about 1163 from part of the lands confirmed to him by King Malcolm, 1161-2. It is described as the house of Wenlock at Renfrew about 1169; a charter of the founder, which is not earlier than 1165, refers to the "lands which the monks first inhabited, and a Papal bull of 1173 describes the monks as having lived beside the mill at Renfrew. By this date, however, the monks had removed to the Cluniac priory at Paisley, (NS46SE 2), to which their former possessions were confirmed. This trans- ference had probably taken place about 1169.